Harding rappelling off of Dolt Tower on the first ascent of the Nose, El Capitan. I had just arrived in Yosemite in the spring of '69 a few days after my discharge from the army. I had driven for three days from Maryland where I was living with my new wife...she stayed home, fortunately. It was early in the morning and I went looking for my partner, Bob Williams, who I was to meet in camp 7.... the one next to the stables. I wandered around and found him talking with Joe Faint and Galen Rowell. So we caught up on things and I was soon engaged in conversation with an older guy who appeared from inside a tent. He was rather short and scruffy looking. I, unfortunately, did most of the talking. I told the guy that I was here to do some big walls and that I had big plans and was going to show the locals a thing or two. I spewed on about how I was going to do the Washington Column and then Half Dome and then the Nose of El Capitan itself!! Back then the Nose had less that about 10 ascents and was still held in awe by everyone and was a career goal of many climbers. Anyway, I asked if the old guy knew anything about Half Dome and he sort of shrugged and mumbled something about not having done the route as he did mostly first ascents.... that statement went right over my head as I was just catching my breath so I could boast a bit more. After a time he said...Well young fella you seem to have it all figured out.... I didn't catch your name. He extended his hand and I said that I was Tom Evans from back East. As I grasp his hand you can imagine my horror as he said... Well it is nice to meet you Tom, I'm Warren Harding. If only I could have run..... but that was a lesson that remains with me to this day..... keep very quite until you know with whom you are talking!! I camped next to him in Camp 4 several times over years and met up with him on some of his recent visits to the valley. Of course he was well into old age and had grown a large stomach but he still had that sparkle in his eye. We had a good laugh last time I talked with him as I related the above story... he claimed to have remembered me but of course that is not possible. He was a great inspiration to me over the years and I have always considered him a personal hero. 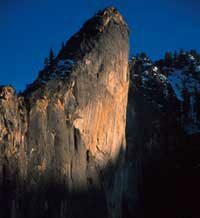 I will miss him.....another irreplaceable character in the history of Yosemite is gone. If you get the opportunity, climb one of Warren's wall routes. After a few pitches, you'll sense Warren's persona, vision and drive like a thumbprint on the line. You'll find minimal mandatory free climbing, and generally, exposed and bold aid climbing up sometimes-unlikely features and, at times, the path of most resistance. The necks of the green glass wine bottles still reside on Wino (Wine, originally) Tower on Wall of the Early Morning Light. Harding's routes The Nose on El Cap and the West Face of Leaning Tower represent two of wall climbing's most notorious jewels, with full reason. Beyond climbing, Warren showed us how to be humble. His light, satirical attitude about the limits of man and stone diffused the righteous and self-aggrandizing attitudes surrounding much of elite wall climbing's exploits of his day. Warren respected everyone and never sank to petty shots at his detractors. 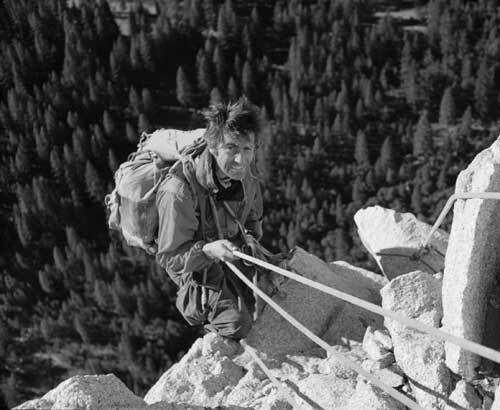 Editors note: Yosemite climbing legend Warren Harding passed away Feb 27, 2002. He will be sorely missed.